Welcome to The Fourth Wall, CHIRP's weekly e-conversation on cinema. This week's subject is the 2008 movie Revolutionary Road. The honeymoon is over. Now what? Throughout much of Hollywood's history, it seems that marriage (especially the wedding) has been utilized as a feel-good capper on many a love story. It's practically a requisite for any traditional rom-com film, right? These tales are usually told from a female perspective*, where the heroine sets out to nab her beau, and the pair ride off into the scripted sunset, either just pre- or post-altar festivities. I've often wondered how much of an impact these messages have on our own desire to get hitched? The pressure comes from all sides in American culture: mass media, religion... hell, even the tax code subtlety encourages it. But for decades, scant attention was paid to the discarded husks of marriages gone wrong. And with a divorce rate estimated at around 50%, we have no shortage of fractured homes in the good ol' United States. Celluloid has caught up in recent decades, with tales about the nightmare of child-custody battles (Kramer vs. Kramer), to the insanity of knockdown, drag-out enmity (War of the Roses). But I'm not sure that any film has done a better job of illustrating the Descent Into Marital Despair that's featured in Revolutionary Road. In Revolutionary Road, directed by Sam Mendes and adapted from Richard Yates' 1961 novel, we pick up the action with the patient already in critical condition. Clearly, things have been boiling over between April Wheeler (Kate Winslet) and husband Frank (Leonardo DiCaprio) for quite some time, with each (esp. Frank) needling the other with lines designed to inflict maximum damage. Frank's miserable as an office drone, while April feels imprisoned by her suburban-housewife existence, trapped by a house and two young children. When April suggests a move to Paris -- a last-ditch effort in her eyes to save the marriage via a change of scenery -- Frank balks at first... but then warms to the idea, and it seems like there may be an inkling of hope for the couple. Their decision surprises their neighbors and friends, though one suspects that most are simply jealous that they didn't have the guts to do the same themselves. As April points out, "it takes courage to live the life you want." Ever-so-slowly, the rug gets pulled out from underneath the two of them. April gets pregnant. Frank gets a promotion -- so he now has more to lose (particularly with no job awaiting him overseas and already feeling uncomfortable at the prospect of his wife being the chief breadwinner). Both have affairs. And all the while, the last flickers of light fade from their eyes. 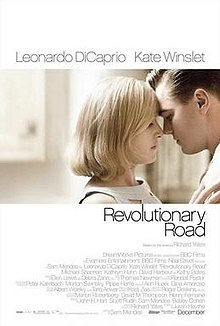 Certainly, it's about as uplifting as it sounds -- but Revolutionary Road is a tour de force just the same. Winslet and DiCaprio are at the peaks of their powers here, with an incredible ability to summon the unspoken tension that envelops the story, and are joined by Michael Shannon in a career-altering, Academy-nominated supporting role. Shannon's been rather typecast in recent years as a laconic heavy, but here he's the Only Sane Man who delivers brutal honesty to the couple. Clarence, how much did the film resonate with you? Did you feel sympathetic towards any of the characters in particular? (Isn't it always true that, try as we might, we can't help picking sides in a divorce or separation?) What sorts of thoughts did this tale dredge up about marriage and relationships in general? Before I answer that, I must heap praise on this film's two lead actors. To me, they are throwbacks to an Old Hollywood that cultivated marquee stars who not only had looks but also serious acting chops. For all the tabloid foolishness he may get into, DiCaprio is dynamite onscreen. And we desperately need more Kate Winslets in the world. Meryl Streep is the reflexive choice for Hollywood’s “Actor’s Actor,” but when it comes to the ability to effectively interpret a role without losing a bit of glamour, Kate Winslet might be even better. What do you think? Of the films I’ve seen, only Who's Afraid of Virginia Wolf matches this movie’s level of intimate viciousness (as good as War of the Roses is, it’s much more satirical in its approach). If I had to choose sides, I would go with Frank. Based on what he overhears from other audience members at the play, I got the impression that April is not, in fact, a good actress. At best, she’s mediocre, and deep down she knows it. She also kept saying something about getting a job in the U.S. consulate, but there's no evidence she has connections or a plan to accomplish this goal. Chucking it all and moving to Paris is a romantic notion, but there’s a lot of practicalities April hasn’t really thought of. That’s quite a risk for a single person, let alone an entire family. The personal alienation of the 1950s was uniquely real and powerful. [In that sense, American Beauty was released about 40 years too late.] Here you have a group of Americans who faced down evil and death while getting exposed to different cultures and technology that was changing by the minute. Throw in the threat of total annihilation from the H-bomb, and no wonder you get the Beat Generation, Bebop, and a perfect backdrop for everything from The Man in the Grey Flannel Suit to Mad Men to this movie. But look at how even today just about every sitcom, every news story, every commercial reinforces the idea of the nuclear family as the ideal way to live. This movie powerfully shows the severe friction that results when people start seeing marriage as just another conformity to go with the office cubicle and suburban tract house, designed and built mainly to maximize someone else’s profit. Shannon's character is the one part that rang just a little bit false to me, but the narrative point needed to be made - who has the real mental illness here? But I might be wrong. Can you think of any dramatic movies where getting a good job, a nice house, and 2.5 kids is portrayed as a good thing? And what is the ultimate goal of existence in America if having these things just leads to more angst? I recently read Nassim Taleb's magnum opus, Antifragile, in which he theorizes that instead of questing for that ever-elusive "happiness," we'd be better off focusing on eliminating the things which cause us unhappiness. They tend to be more universal... and achievable. I don't know that a mansion would make me happy, but going hungry and/or living in a crummy neighborhood would sure leaving me feeling rather dejected about life. As far as dramatic films which are geared around the quest for financial security, The Pursuit of Happyness (2006) comes to mind, with Will Smith as a down-and-out salesman trying to provide for his young son. What about Boyz n the Hood (1991), where the main character is seen as a success for navigating south-central LA and heading off to college -- ostensibly to acquire a good job and those 2.5 kids? Again, while an idyllic home in a peaceful suburb may not be everyone's idea of personal fulfillment, there's no one that enjoys living in poverty. Also, are these sorts of goals specific to America? We reside in a consumer culture, sure, but wouldn't these values also be championed in the UK? France? Brazil? Citizens who have good jobs and families generally make for a stable society, and this is something that all governments desire, regardless of ideology. Completely agreed on Kate Winslet, but I think we're lucky to have a number of actresses with her level of thespian chops around in this day and age. Cate Blanchett and Rooney Mara (appearing together in the fantastic Carol) would also be on my short list. Julianne Moore, perhaps? And Michelle Williams (Wendy and Lucy, Take This Waltz, Manchester By The Sea -- wildly-different roles, and she was brilliant in each). I sided with Alice instead of Frank -- at least she seemed to be trying to break out of her shell? She was doing theater, while her husband was using his status as an executive to shack up with the company secretaries. And was it really that much of a risk to try Paris? Sure, it's true that it might not have worked out... but staying where they were was guaranteedto end in misery, so why not take the chance? You mentioned the brilliant American Beauty, and how it could certainly have resonated with the Beat Generation of the 1950s. I might say the same thing about Fight Club, which took those notions of nihilism and frustration with corporatism and translated them onto an entire movement. American Beauty is almost 20 years old. What does the modern-day zeitgeist of marriage and family look like today, and how are those feelings represented in cinema? If not much changed between the '50s and '90s, then perhaps these same feelings and malaise are still prevalent today? I will say that the cultural pressure to get married and start a family is much less today than half a century ago. Would April and Frank have gotten hitched at all if they met at a cocktail party in 2018? I doubt it. Marriage was much more of an automatic expectation for every adult in the 1950s than it is today. As in, if you weren't married by the time you hit 30 (especially as a woman), people would talk, and not about how brave your life choices were. And after years of deprivation and sacrifice that came with the war, with the United States emerging as the unquestioned masters of the Earth, the pressure to take your place in the new consumerist-corporate machine must have been enormous for those who qualified. In a way, I think Nassim Taleb's theory clashes with a certain American Puritanism that says in several ways "If you're not suffering, you're not achieving anything." It's easy to interchange "suffering" and "unhappiness" in our daily lives, which leads to the idea that in some ways certain people like suffering to a certain extent. The elimination of unhappiness turns you into one of those carefree liberal hippies... and who wants that? That reboot of Rosanne did really well in the ratings this week. Of course, its main star is still controversial -- apparently she's a vocal supporter of Trump. But it makes sense. Roseanne hasn't been poor for a long time. When the show made its first run in the late '80s, she became the second-highest paid female actor in Hollywood, behind Oprah. As a rich, loud, unstable TV star who rubs people the wrong way, she has more in common with the current President than the family she portrays on TV. That's a great list of actors you mentioned, and that generation of acting talent is not getting its due. Thanks, Avengers...! But at least the Netflixes and Amazons and TCMs are here to distribute those small, non-blockbuster movies that feature acting and writing over effects and more effects. It continues to amaze me how things evolved with cinema -- if you want to see something that approaches artistic in the traditional movie-snob sense, you need a TV...! Did you see this movie? Want to add to the conversation? Leave a comment below! Share March 30, 2018 • http://chrp.at/1pmK • Share on Facebook • Tweet This!